Your asthma specialist may prescribe a diskus inhaler. It contains a dry powder form of your medication. The device looks like a disk. You can see a demonstration of its proper use by watching the accompanying video. You’ll learn about the different parts of the inhaler, and you’ll discover how to hold it properly. This asthma educator walks a patient through using her new diskus inhaler. To use yours, you’ll place your thumb on the thumb grip and push this part back until you hear a clicking sound. Then, you’ll inhale deeply and quickly through the mouthpiece. Hold your breath for 10 seconds before exhaling away from the inhaler. Patients who have questions about their asthma treatment can consult a board-certified immunologist at Allergy & Asthma SpecialistsSM. Call 1(800)86-COUGH to reach one of our asthma treatment centers in Blue Bell, Center City, Lansdale, Philadelphia, Jenkintown, Pottstown, King of Prussia, or Collegeville, Pennsylvania. You may already know that allergies and asthma are closely intertwined. For example, a patient’s asthma may be triggered by exposure to an allergen. But did you know that eczema is also linked to both allergies and asthma? If you develop any unusual symptoms, such as changes to your skin, it’s a good idea to tell your allergy and asthma specialist about them. The frequent scratching can cause the skin to become raw and sensitive, and it may cause the bumps to crust over. In severe cases, excessive scratching can lead to skin infections. According to the American Academy of Allergy, Asthma & Immunology (AAAAI), about half of all patients who have moderate to severe atopic dermatitis are also diagnosed with asthma, food allergies, and/or allergic rhinitis (hay fever). While the exact reason for the connection is still under investigation, there are a few theories. 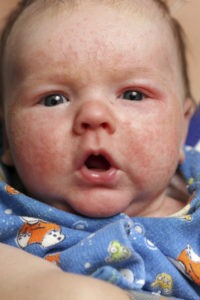 Some people with eczema have errors in the Filaggrin gene. This means that the skin lacks a specific protein it needs to maintain a strong barrier against germs and irritants. As a result, the skin is more sensitive to the irritants that can trigger eczema. In addition, that same defect may allow for greater exposure to allergens, which is thought to make people more sensitive to those substances. At Allergy & Asthma SpecialistsSM, patients with allergies, asthma, and related conditions will find a complete spectrum of compassionate care delivered by board-certified allergy doctors. New and current patients can schedule a visit with an asthma doctor by calling 1(800)86-COUGH. Our offices are conveniently located in Blue Bell, Center City, Lansdale, Philadelphia, Jenkintown, Pottstown, King of Prussia, and Collegeville, Pennsylvania. Knowing the difference between a cold and allergies means you can get the right treatment and feel better, faster. When you know the right allergy doctor to call, you can be confident that your doctor will find the solutions you need to control your allergies. At Allergy & Asthma Specialists SM, we use allergy skin testing and asthma screening to determine the source of your discomfort. If you’re suffering from asthma or allergies, we offer immunotherapy to alleviate the problem. Our goal is to provide you with top-quality medical care focused on controlling allergic reactions and asthma here in a comfortable environment. Call us at 610-825-5800 or reach us through our website for an appointment, or to learn more about all we have to offer.